Jackie and Robert van Dam are two guests who recently joined a Canopy Tour and did something truly amazing. They donated $2000.00 to our Canopy Conservation Trust, to put towards our pest eradication programme and to help us continue to maintain our slice of paradise! Have a look below at what encouraged them to donate. Jackie and Rob were somewhat unsure of what their plans in Rotorua would be while on holiday. They stumbled across a Canopy Tours brochure and decided to do a little investigating. They "try to maintain an environmentally sustainable lifestyle so were attracted to a forest tour that enabled [them] to trek through the forest leaving minimal impact". There were however mixed feelings about spending three hours up so high, Jackie is scared of heights, while Rob was racing to go. Rob had already been canoeing and white-water rafting, so they compromised on the adrenaline and Canopy Conservation drawcards and decided it was something they could enjoy together. Jackie has a big fear of heights. However, what made it more bearable was "that it kept [them] off the forest floor". Ultimately, her experience was made by the guides. "Tom held my hand when needed and gave me lots of encouragement. Dan told cheesy jokes and entertained the crowd. He also did a great job of catching us at the other end which was quite important. They were both wonderful, I'd give them a job any day". She also mentioned that Rob loved the ziplining, being the adrenaline seeker he is, it was right up his alley. We asked Jackie and Rob what their most memorable part of the tour was. Every person has a different answer as we all take something different away from the tour. They said that the best thing for them was the knowledge base that their guides had. "Not only of the zip lines and keeping everyone absolutely safe, but their knowledge of the work you are doing to try to restore the forest and encourage wildlife to return. New Zealand is an amazing country, still small enough to combat your environmental issues somewhat." It was clear that their experience was enough to convince them to donate to our Conservation Programme. Donating $2000.00 to our Conservation Programme is no small feat. It will allow us to complete Conservation projects through the Canopy Conservation Trust. We wondered if they had previous involvement with Conservation Programmes and what specifically made them donate. They "haven’t had anything to do with organised Conservation, but do the most [they] can in day to day life. 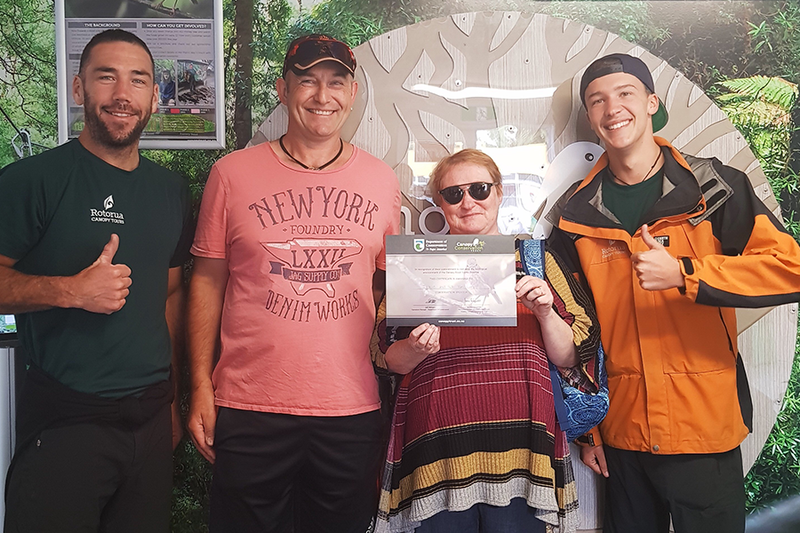 The reason for donating was truly amazing and it's lovely to see that we inspired someone to do their little bit for NZ Conservation and improve life in the forest. "We decided to donate to your Conservation Fund because you are doing an absolutely essential job in an inventive way and getting results. But mainly because your government doesn’t seem to help. We could donate in Australia but our government does throw some money at the issues of Conservation. Tom and Dan also played a part". Jackie and Rob left us with this last message. After spending three hours exploring the forest, they had this to say. "We hope the modest donation we made to your Conservation Trust has helped to kill a few more vermin. We were a little taken aback by your reaction. We thought a lot of people would donate to assist in your most worthy efforts. If they don’t they should." We cannot help but acknowledge them for all they have done. $2000.00 will go a long way to ensuring we are able to continue our Conservation work and do our bit for NZ Conservation. It will help us to continue to show our beautiful forest and wildlife to local and international visitors alike. It goes to show that what we are doing does address a bigger picture than just our little slice of paradise in Dansey Road.